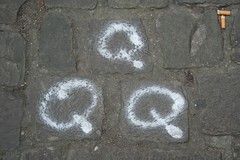 I've seen these around Brussels a lot recently, usually as a stencil, always on the pavement. Has anyone any ideas about what is going on? Peut-être en rapport avec les parkings?